The hip joint is a classic ball and socket design: simple, secure and reliable. Why then does it go so badly wrong for so many dogs? All this causes a vicious cycle of pain and worsening progression of the disease. ‘Mouthing’ hands when handled around the hip joint. Rolling or swaying of the hips like a bear when walking. Notice we didn’t say: “crying in pain”. Dogs with hip dysplasia never show the pain they are feeling. It’s up to you to look for it. They also almost never hold the leg off the ground. If the leg is not weight-bearing, there could be another problem. Visit this page for other reasons why dogs limp on the back leg. Older dogs also show stiffness after rest and muscle wastage. We still don’t really know what causes it to start happening. We do know there are both genetic and environmental factors. Knowing these can help your dog. 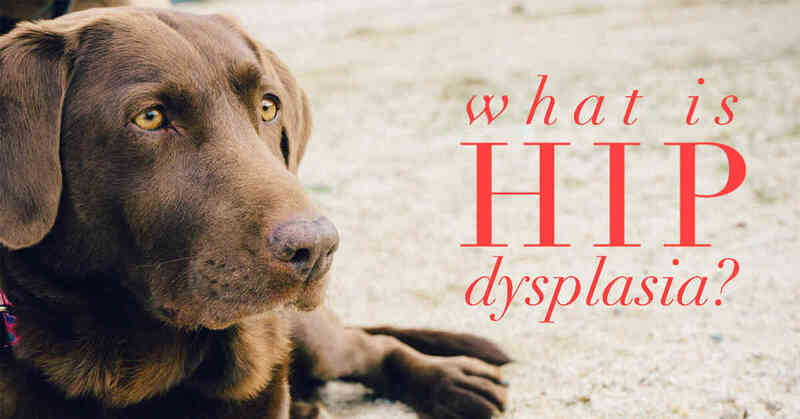 Which Breeds Get Hip Dysplasia? All dogs big and small can get it, but the risk varies between breeds. Possibly the worst we see are Golden Retrievers, Labradors, Rottweilers, German Shepherds, Samoyeds, Spoodles & Australian Bulldogs. Visit our page on the inherited diseases of dogs to check your breed’s risk. This doesn’t include all breeds reported to get hip dysplasia, so if you are thinking of getting a special breed, ask us for our opinion on how common it is. If you already want or have a susceptible breed, don’t worry. Just because you’ve got one of these breeds doesn’t mean your dog will be affected, and there’s still a lot you can do. Read on! 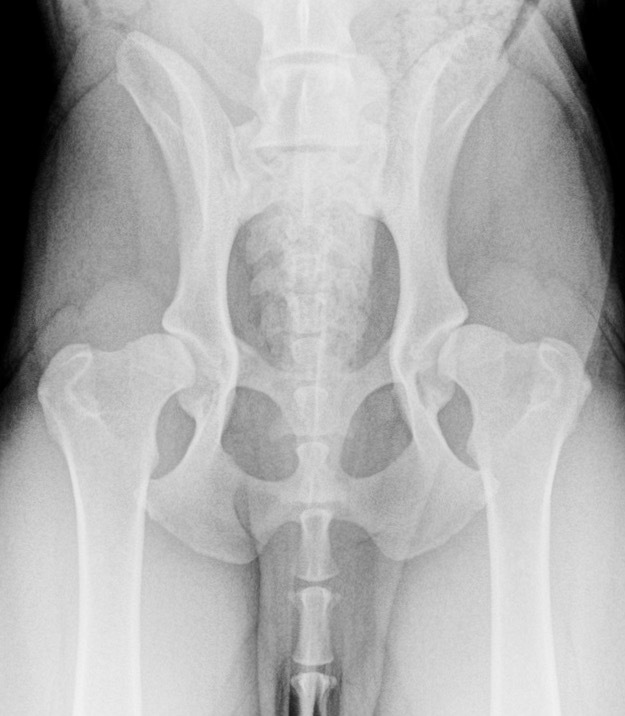 If you are looking at getting a susceptible breed, you will already know that their parents should have had hip scoring X-rays. The sad reality is that in 30 years of hip scoring, the incidence of hip dysplasia has not gone down. Does this mean the program has failed? It’s hard to tell. We are certainly more comfortable when a puppy comes with hip score data, and on an individual level it probably helps. It also shows the breeder is trying to reduce the risk. If you only do one thing, this is the one. Do not let your puppy get fat. We will help you keep your puppy stay lean if you ask for our advice. Here’s our page on knowing how much to feed a puppy. Home-made diets are associated with dysplasia (Alenza et al, 1998). If possible, buy large-breed specific diets which are designed to reduce risk further by close control of calcium, protein and energy levels. We recommend using Hills Large Breed Puppy or Royal Canin diets made for large breed puppies. 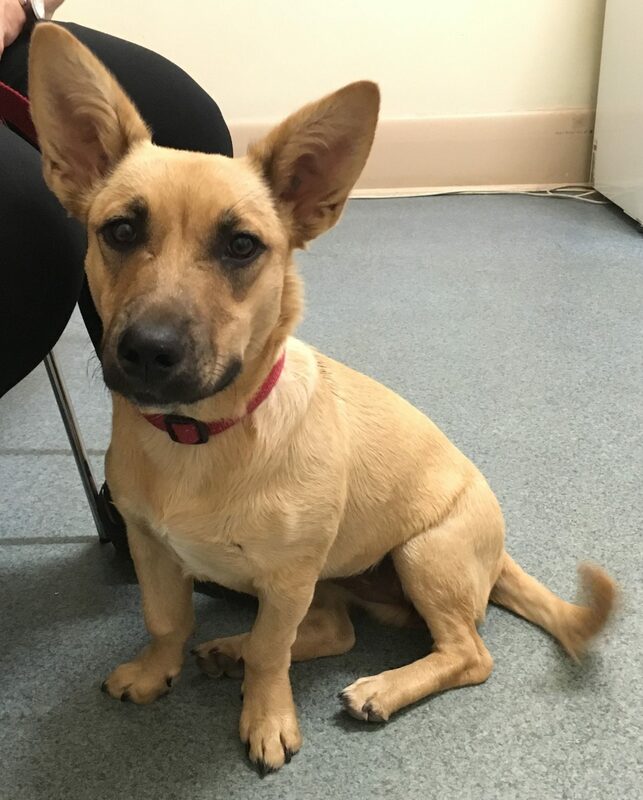 If you want to feed a home-made diet to an at-risk breed, we suggest you start once they are fully grown. This is when puppy owners look at us like we’re asking them to stop the tide coming in or the wind to stop blowing. Don’t worry, we know puppies will run a lot; we’re just saying don’t encourage running or jumping until fully grown. Ball throwing and dog parks are the main culprits. There is evidence that desexing Labradors, Golden Retrievers and German Shepherds after they are one year old may reduce the risk of hip dysplasia. We’re starting to recommend this in at-risk breeds if a male dog’s behaviour remains acceptable. What we do depends on the age of your dog. In puppies there is a real chance of a cure, or at least a reduction in how bad they will be. It’s important to act quickly and follow a tight timetable. Here’s how. As part of your puppy’s 16 week check, your vet can perform an Ortolani test on at-risk breeds. We do this at the 16 week vaccination. That’s the video earlier; it looks easy but please don’t try it. It can easily do damage if not done properly and only makes sense if you have done a lot of normals for comparison. If the test is positive, X-rays should be booked for the first available surgery day. If these confirm the presence of hip dysplasia, a simple surgery called a Juvenile Pubic Symphysiodesis is performed. This closes a growth plate & causes the pelvis to change shape as it grows, especially where the socket covers the ball of the hip joint. In mild to moderately affected dogs, there should be a substantial improvement in the degree of hip dysplasia experienced as an adult. There are few disadvantages with the surgery. It can narrow the birth canal, but this procedure should not be used on breeding dogs anyway, since an affected dog should not be bred. 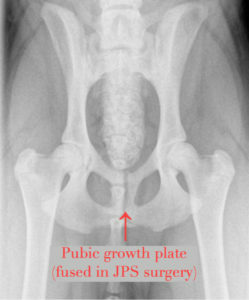 Dogs older than 16-20 weeks are no longer good candidates for JPS surgery. Those less than 10 months can benefit from a specialist procedure called a Double Pelvic Osteotomy (DPO) or a Triple Pelvic Osteotomy (TPO). Again, speed is of great importance so if you suspect your dog has hip dysplasia, get them checked straight away. Once the dorsal socket rim is blunted, the surgery may not have much benefit. Dogs older than 10 months of age are best managed conservatively via antiinflammatories, weight control and exercise restriction. Severely affected dogs are good candidates for hip replacement. Up to around five years of age, most dogs are suitable for Total Hip Replacement. THR is a well-established technique with good outcomes which is available as via specialist referral surgeons though possibly not in Adelaide quite yet. After this time, remodelling of the hip joint due to osteoarthritis becomes severe, and THR may not be possible. This is a salvage procedure to prevent contact between the two diseased halves of the hip joint. The ball and its neck are removed from the thigh bone and their surfaces smoothed so that the hip joint is supported by the soft tissues only. Despite the sound of it, this surgery can give acceptable, pain-free results for many small and medium-sized dogs. A false joint will never be as good as the original. However, if we choose our patients carefully, it can restore good daily function including running and jumping. Aggie here is a good example. She came from a shelter with an old injury and FHO was the only option by the time we saw her. She’s regained good muscle mass in the leg and is using it well. We have used stem cell transplants in affected hips in the past, but results were not encouraging. Until more science supports its use, we do not recommend this treatment. 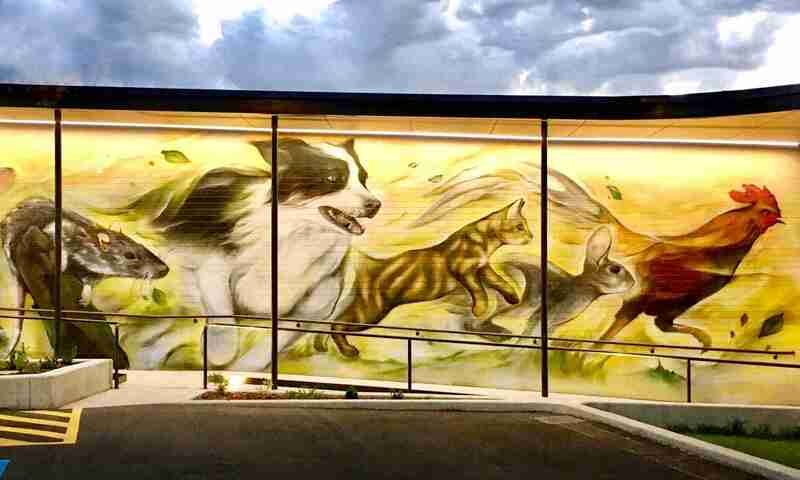 Adult dogs not eligible for THR or FHO need control of arthritic pain. There are a lot of good options. This is a whole subject in itself. We have a page dedicated to the more evidence-based ways to manage arthritis and joint pain in dogs. Please visit before you go, and ask us why so many of the therapies you’ve heard of AREN’T there! Alenza, D. P., Rutteman, G. R., Peña, L., Beynen, A. C., & Cuesta, P. (1998). Relation between Habitual Diet and Canine Mammary Tumors in a Case‐Control Study. Journal of veterinary internal medicine, 12(3), 132-139.